My body is dying. Nerves from brain to legs are already dead, so I sit in a wheelchair. Other members are in the dying process. Cause? Aging, which leads to dying, which is God’s curse on our sin. Primary Lateral Sclerosis is a specific cause. Not terminal, but incurable and progressive. A few days ago, that truth turned on like a light in a dark room. 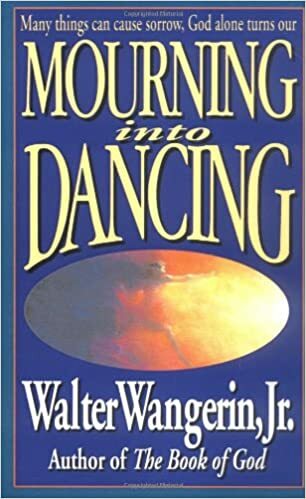 For our devotions now, Lois and I are reading Walter Wangerin, Jr.’s book, Mourning into Dancing. “Wangerin is widely recognized as one of the most gifted writers writing today on the issues of faith and spirituality” (Amazon). Wangerin postulates that we experience many Secondary Deaths before we die absolutely. Retirement, he writes, is one of those Secondary Deaths. I think he’d agree disease or disability are two others. When I read aloud what I’ll quote below, I struggled to continue. I was weeping. There I was on the page. I’ve written quite often of my condition. (Really?) Not because I’m self-absorbed (I hope), but because, in this case, so we might better understand and help someone we love caught in this Secondary Death. And so we might be better prepared for our own. Here’s what I read from Mourning into Dancing . . . The third time when we are most vulnerable to this Secondary Dying, the sense of futility at the end of things, comes when we enter what society calls “retirement.” (I’ve been in it 2 1/2 years now. Little, if anything, about it is “golden.” Actually, I suspect “retirement” was concocted by an alien government to make us virtually useless and generally impotent.) Worker after worker, however he might have looked forward to the freedom, is astonished by the sorrow that seizes his soul. Sorrow? Why, gloom and a bitterness too, which seem to have no cause. Grandpa sits in a chair and stairs at the wall. He’s healthy. He’s sharp. He’ s able. He’s free! And yet he is so sad. Worse, when we try to help him he scolds us, as though we did something wrong. But we love him! He’s sad and he’s mad when he should be happy. We do not understand the man. Well, but his hands are empty. And so is the self. And so is the world, therefore. All at once the man is not doing anything he considers genuinely important. That which used to authenticate his being, and his being here, has been torn from him. He has been sundered from his reason to be, his worth, his purpose, his name, his repute, his glory. Can we stress enough the separation that is death to him? He is like “Adam,” whose name means “soil”, who was sundered from the soil, the stuff of his work and identity. Grandpa is not suddenly peculiar. It doesn’t have to be Alzheimer’s Disease. Don’t dismiss him as senile and cantankerous. First seek causes not in his mind but in his spirit: he has died. He is grieving. Wangerin doesn’t sound very Christian, does he! Doesn’t he have a timely Bible verse to hit Grandpa upside the head with? Like, Paul: ” . . . it is my eager expectation and hope that I will not at all be ashamed, but that with full courage now as always Christ will be honored in my body, whether by life or by death. For me to live is Christ and to die is gain . . . My desire is to depart and be with Christ, for that is far better” (Philippians 1:20, 21. 23b). Wangerin will reach the good news of “The Drama of Redemption” in final chapters. For now, he’s explaining why Grandpa is grieving. And maybe help us understand and offer sensitive help to ones grieving over a Secondary Death like retirement. If we or a loved one grieves over retirement (or chronic poor health), the Holy Spirit will enable us to grieve not as those who have no hope. ” . . . we do not want you to . . . grieve like the rest of men, who have no hope” (1 Thessalonians 4:13). What “hope”? Paul writes to Titus: He refers to this time “while we wait for the blessed hope– the glorious appearing of our great God and Savior, Jesus Christ . . . ” (Titus 2:13). He , ” . . . by the power that enables him to bring everything under his control, will transform our lowly bodies so that they will be like his glorious body” (Philippians 3:21). Using the broken-body-parts metaphor, at his coming Jesus will fix the brokenness and put the now-working parts back together. But this will be no repair job. No Gorilla Glue or Duct Tape. This will be transformation. No, it will be glorification of dying bodies into ones that will never die, age, sneeze, stumble, or have to be laid in the ground or cremated to dust. This is how it will be when the dead are raised to life. When the body is buried, it is mortal; when raised, it will be immortal. When buried, it is ugly and weak; when raised, it will be beautiful and strong. When buried, it is a physical body; when raised, it will be a spiritual body. There is, of course, a physical body, so there has to be a spiritual body. For the scripture says, “The first man, Adam, was created a living being”; but the last Adam is the life-giving Spirit. It is not the spiritual that comes first, but the physical, and then the spiritual. The first Adam, made of earth, came from the earth; the second Adam came from heaven. Those who belong to the earth are like the one who was made of earth; those who are of heaven are like the one who came from heaven. Just as we wear the likeness of the man made of earth, so we will wear the likeness of the Man from heaven. The park in Pakistan is a regular gathering place for Christian families on Easter Sunday. Muslim families, too, in this majority-Muslim nation, flock there for fun. Yesterday it became a place of exploding terror. A suicide bomb killed at least 70 people. Many more lie in critical condition. Among the dead: 29 children. “The target was Christians,” a faction [of the Taliban] spokesman, Ehsanullah Ehsan, said. “We want to send this message to Prime Minister Nawaz Sharif that we have entered [the city of] Lahore.”. So far, 14 of the dead have been identified as Christians. The rest were Muslims. Since Christians were targeted, I assume Muslims were merely collateral damage—unless the murdered weren’t the “right kind” of Muslim. This comes only days after an airport-and subway-terrorist attack in Brussels, Belgium that left 35 dead and nearly 300 wounded, four Americans among them. burned to death, what would I do next? What would I think? How would I pray? Where would I go? How would I endure the pain of the next days? Of the next months? Would I hold on to my faith, knowing I and my dead child have no other hope but the Lord? Or would I curse God and die? Surely, were I to persevere through so dark a valley, it would be only by God’s grace. I think of Jesus’ words . . . In the world you face persecution. I’ve been warned. And promised. But could I possibly have peace and courage after that? Perhaps God gives a special gift of faith for such evil days. I think, too, of that unsettling passage in the Book of Revelation . . .
who were to be killed as they had been was completed. I’m not a Revelation expert. But three implications seem clear here. One, the Sovereign Lord has a day when he will avenge the blood of his martyrs. If I was a parent whose child burned to death yesterday, I would want revenge. (I suppose I should call it “justice” to be more holy.) I would be briefly angry at God. I would be angry at President Obama for his nonchalant attitude toward terrorist attacks. But eventually, by grace, I would put my hope for justice in the hands of the Sovereign Lord whose judgment day is coming. Two, this world is not a friendly place for Christians. It doesn’t seem so hostile to us in the U.S. Even the persecution some have recently endured here (a baker forced out of business) is pretty mild compared to bombing innocents in a park. For the most part, we can feel rather at home here. That’s not only because persecution so far is little. It’s also because we get co-opted by the culture , until the biggest difference between us and the world is we go to church on Sundays and read the Bible occasionally. Reviewing violence in today’s world, I’m reminded it’s coming here. With eight grandchildren whom I dearly love, I don’t even want to think that. But how can I blind my eyes to what seems a blatantly fearful reality? When you come down to it, we are really aliens and strangers in an unfriendly world (1 Peter 2:11). Three, more committed Christians will be killed. In the text above, the martyrs in heaven (!) are told they must wait a little longer for the Lord to avenge their blood “until the number of their fellow servants and brothers who were to be killed as they had been was completed.” More will be martyred. There’s a number that God knows or perhaps has set. Then his justice will prevail. I sometimes wonder what professed Christians in America’s churches will do if terrorists show up here to target us. Will our numbers sharply shrink? I think, too, of those preachers who invite unbelievers to come to Jesus with promises of practically heaven on earth. And of pastors who blithely welcome new members thoughtless about the day membership may make them a terrorist’s target. And I wonder, too, if I would shut down my blog and become a closet Christian if terrorists targeted us here. I hope I sound realistic, not pessimistic. I’m concerned that our—and my—Christianity may be too weak to stand whatever tests may come. So I write to remind us all—and me especially—that now is the time to prepare. Today I must toughen up in my faith. And I must remember, come what may, I’m on the winning side. After all, our Sovereign Lord said . . . Listen! This may help. He’s “Overcome”! Holidays are heart-hurting times if a loved one has been lost. Christmas must be the loneliest, but Easter can’t be far behind. Celebrating Jesus’ resurrection that points to coming reunion which in turn must make the present only emptier. When the Bible predicts the future, it leaves foggy spots and unanswered questions. It’s a sunny and clear forecast, though, when it tells us we will live because Jesus does (John 14:9). Consequently, we have hope, but not without grief (1 Thessalonians 4:13). What follows is a passage from Walter Wangerin’s excellent book, Mourning into Dancing. (Wangerin is a Lutheran minister, award-winning author, radio broadcaster, professor, husband, and father, who is slowly dying of cancer.) Mourning into Dancing is available from Amazon–-http://www.amazon.com/Mourning-Into-Dancing-Walter-Wangerin/dp/0310207657/ref=sr_1_1?s=books&ie=UTF8&qid=1458930935&sr=1-1&keywords=mourning+into+dancing. and gave me a respite from the question. But I didn’t forget it. But I want to refine that answer until it truly comforts you, Gloria. It is not meant cheaply. It comes after long thought. 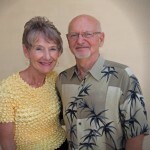 Listen: when Sonny Boy left this life, he left creation as God gave it unto us. He left all things and the space that contains things. He left history and the time that contains history. He departed time, Gloria, immediately and entirely to be with God. You and I are still inside of time. We will move in tiny ticks of seconds through long months and the interminable years. Through days and days we creep toward the Last Day, when all of us will meet God, the living and the dead together, because on that Day the dead will be raised to life, and Sonny Boy too. From our perspective, that’s a long time away. But Sonny Boy has popped free of time. From his perspective, there is no time any more. He doesn’t have to wait. He is there already! For him it is already the Great Gettin’-Up Morning—and he’s up! He is raised from the dead. And we are there too. And we are meeting each other in the joy of the saved. And when you and I have died, all that is now for Sonny Boy will be now for us as well, as if no time at all had intervened. He is with the Lord. But we have a while to wait yet before we experience the now he knows. But he’s not waiting. Between you and Sonny Boy, Gloria, you are the lonelier one. All your sorrow has been for yourself while still you are stuck in time. He’s the glad one. From his perspective he has never been apart from you. The instant he rises from the dead, so do you. It’s a mystery. We shall not all sleep (which sleeping makes time a mere blink to the sleeper). But we shall all be changed. In a moment. In the twinkling of any eye. At the last trumpet. O death, where is they sting? Therefore, my beloved Gloria, be steadfast, immovable, always abounding in the work of the Lord, forasmuch as you know that your labor is not in vain. No, not in the Lord.